Infinity Blade Dev: "We're in the Golden Age of Gaming"
Chair's Donald Mustard reckons we've never had it better than we do now. There's a lingering consensus in certain gaming circles that things "used to be better." Of course, there seems to be no agreement on exactly when said things used to be better. Some insist the PS2-era was gaming's highest point, others maintain it was the PC scene back in the 90's, a few are adamant that things started to go wrong when games switched to 3D, and presumably there's at least one person out there who's absolutely sure the industry doomed itself the second it abandoned the oscilloscope. In contrast, Donald Mustard, creative director at Chair entertainment, reckons gaming has never been better. "I honestly think we're in the golden age of gaming at the moment," he told Hookshot inc. "There are games for zero dollars that are really worth playing, and then there are these games for sixty dollars which are just incredible experiences. And there's everything in between. It's just an awesome time to be a gamer." Formed by Advent Rising creators, Donald and Geremy Mustard, back in 2005, Chair Entertainment has thus far seemed to specialize in sprucing up classic gameplay models with modern visuals. Their second XBLA title, Shadow Complex, which was essentially an updated Super Metroid running on the Unreal 3 engine - broke XBLA sales records on release. 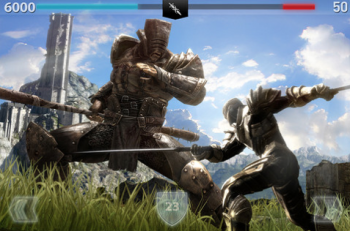 Their next game, Infinity Blade, pretty much played like Punchout with swords, albeit quite a lot of swords. It went on to make publisher, Epic Games, some 30 million dollars and prove there was a market for more involved games on the iPhone. "I'm naÃ¯ve, perhaps, but I definitely believe in the "if you build it, they will come" mentality," continued Mustard. "Just look at the math behind it: we're approaching 400 million iOS devices that can play these sort of games. We'll soon be passing half a billion, and that's so much more than the number of Xboxes that are out there. There's just a huge number of people with these devices, with these powerful gaming machines in their pockets. The market is there, and good games, good apps will rise to the top." Personally, I kind of hoped the "golden age of gaming" would have more buttons, but I'm kind of old-fashioned like that.